Crypto Garage, Inc. (HQ: Tokyo; Representative Director: Masahito Okuma; Crypto Garage), a Fintech company developing blockchain financial services and also a subsidiary of Digital Garage, Inc. (TSE first section: 4819; HQ: Tokyo; Representative Director, President Executive Officer and Group CEO: Kaoru Hayashi; DG), reveals “SETTLENET” (https://settlenet.io/), a suite of products to enhance application development on the “Liquid Network”, a Bitcoin sidechain launched by Blockstream Corporation (HQ: Victoria Canada; CEO: Adam Back; Blockstream), a company developing blockchain technology. 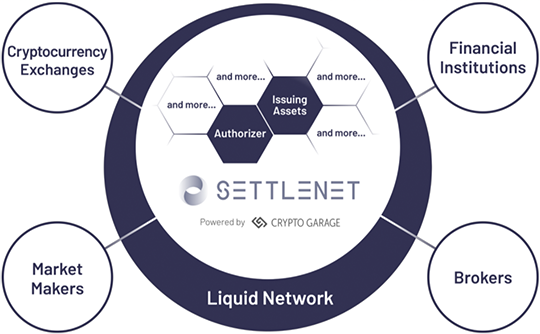 SETTLENET will provide Liquid Network members, including cryptocurrency exchanges, with functionality required for issuance, trading, and transaction monitoring of digital assets. By developing SETTLENET, Crypto Garage aims to augment Blockstream’s products and services to further support Liquid members by improving the efficiency of their trading and businesses. Crypto Garage develops SETTLENET under a technology partnership with Blockstream. Crypto Garage further plans to add new functions to SETTLENET in concert with the product specification and roadmap of the Liquid Network. As a first product of SETTLENET, Crypto Garage plans to release “SETTLENET Issuing Assets” in the spring of 2019, which supports the members to issue digital assets and/or tokens on the Liquid Network.